Atlantic DocuSHRED is an independent, locally owned and operated Document Destruction Company servicing Nova Scotia, New Brunswick, Prince Edward Island and Newfoundland. We provide Atlantic Canadian Businesses with a cost effective alternative to the current National and Multi-National competitors in the marketplace. 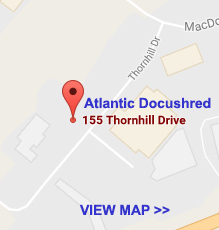 Atlantic DocuSHRED provides Secure On-site Document Destruction Services at our customer’s place of business. Atlantic DocuSHRED operates fully automated, modern, state-of-the-art shred trucks using pierce and tear shredding technology. Our equipment and service assures that no person touches or handles your sensitive documents outside your place of business. The loading and shredding process is fully automated keeping human hands off your sensitive documents ensuing the utmost security. You can witness, inspect and verify the entire shredding procedure via our truck's equipped closed circuit television (CCTV) at your place of business. Atlantic DocuSHRED ensures the highest security for your sensitive records. Our technicians are uniformed, security screened, and bonded for your peace of mind. 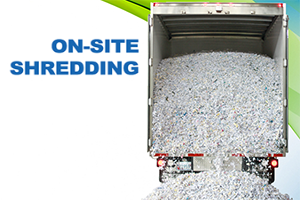 We offer a friendly, courteous and professional paper shredding service at your place of business. Atlantic DocuSHRED provides locked security containers FREE of charge to protect your documents between service visits. You have the choice of high capacity rolling containers or attractive executive consoles to suit your office environment and needs. Let us know more about your requirements and an Atlantic DocuSHRED representative will contact you with a quote. Are you doing all you can to protect the privacy of your clients? 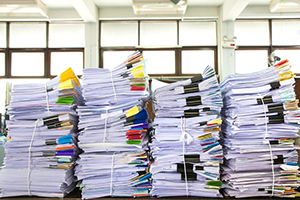 Atlantic DocuSHRED’s mission is to provide our clients with a one-stop solution for all your document destruction requirements. 100% NAID Certified - Atlantic Docushred is certified for mobile document destruction, adhering to the stringent security practices and procedures established by the National Association for Information Destruction (NAID).